Place a Light Catcher sheet on the design surface, flip the switch, and bring your designs to life! This sturdy take-along design desk makes your "stained glass" masterpieces glow, even on gloomy days. 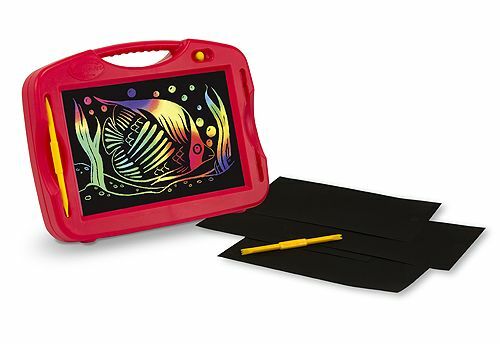 A backlit pane shines through Scratch Art Light Catcher sheets as you etch! Just use the included stylus tools to see amazing stained-glass effects light up. 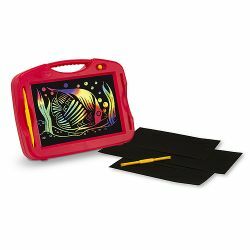 The kids arts-and-crafts set comes with four Light Catcher Scratch Art sheets, two design tools, and the illuminating design desk light box toy. Refill with any standard size (8.5 x 5.5 in) Scratch Art Light Catcher sheets.